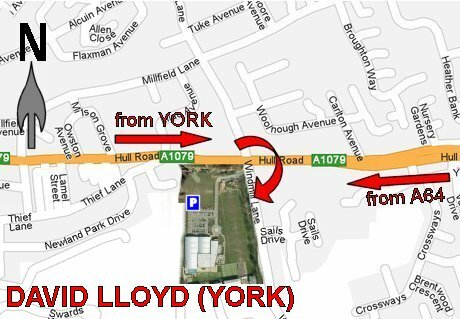 The David Lloyd York fitness centre is just off the A1079 Hull Road east of the York city centre. From the centre you can get onto the A1079 from the inner ring road heading out of York at the traffic lights at the Barbican gate. Or head into York off the A64 by-pass at the Hull Road roundabout signposted York A1079. The entrance to David Lloyd is from Windmill Lane at the junction with A1079 Hull Road. There is plenty of parking outside the building. There are indoor and outdoor tennis courts available.